Big Country was always the collective sum of the individual parts, and this album showcases the unique chemistry of the four musicians and at the same time, celebrates Stuart’s Adamson’s wonderful, powerful lyrics and huge musical contribution he made. For decades, music fans have traded recordings of their favourite bands in concert. Fans in car parks at shows and in fanzines got the word out about the existence of these recordings. As they were traded, the quality dissipated as a tape often times became a tape of a tape of a tape of a tape. Recordings made by eager fans holding tape recorders in their hands trying not to scream and shout during a show and spoil their recordings. Usually, these fans risked the ire (if not the fists) of venue security if they were even suspected of recording the show. But sometimes, even those who were working the venues were involved in the trade by providing recordings directly from the sound desk, the gold standard of the ‘bootleg’ trade. The early days of the internet brought tape traders and fans from all corners of the Earth closer together. Dial-up internet with speeds varying from 2400baud to latter day 56Kbps speed and Bulletin Board Systems (BBS) were the order of the day. As time went on and high-speed internet became more widely available, the mp3 format became popular and converting tapes to mp3 format and trading via broadband became popular. Just as the internet was beginning its stronghold in the mid ‘90s, Big Country experimented musically. A chance power outage at a show in Detroit, during their tour of the United States in 1993, forced the band to try a fully acoustic show. After the positive response they received, they continued to perform acoustically from time to time, including performing both acoustic and electric sets for the recording of Without The Aid Of A Safety Net. During the period of recording The Buffalo Skinners and Why The Long Face, Big Country also experimented with playing cover versions of other bands’ songs. Appearing as B-sides on several singles, and occasionally in the encores of shows, cover versions of songs like The Beatles’ ‘Eleanor Rigby’ and The Rolling Stones’ ‘Ruby Tuesday’ were front and centre on the 1996 release, Eclectic. The collection presented here is a small sample of the recordings that were popular among fans. Minneapolis 1993 from First Avenue first became widely available from the USA fanzine All of Us and was given the title ...And The 7 Year Itch. Stirling 1994 from the McRobert Centre was widely popular for its high quality and its diverse set list. Rotterdam 1995 from Rotown became widely popular and was dubbed as a ‘Sheepshaggers’ show due to some of the interaction that Stuart Adamson had with the audience during the performance. It is this hallmark interaction with the fans that made recordings of Big Country highly sought after. Both the songs and the banter were memorable. This close connection with fans is also present in their intimate appearance at the Glasgow Tower Records store in 1995. Also included here is a performance in 1998 from Tappie Toories, a pub that Stuart Adamson owned in Dunfermline at the time. Rounding out the collection is a cover of The Monkees’ ‘Daydream Believer’ recorded at Tunbridge Wells High Rocks in 1995. The first show on this package was performed shortly after the release of ‘The Buffalo Skinners’ in 1993, which reunited you with Chris Briggs, the A&R man who signed you. How do you feel this partnership affected the album’s recordings? TONY BUTLER: Having Chris Briggs back in the A&R seat was a major boost at this time. He would be instrumental in helping the band to re-focus and re-align its creative intentions after the confusing responses to the previous two albums. Chris had been a very big inspiration for us during the making of The Crossing and brought the same atmosphere second time round. If he was sitting at the back of the control room with a big Cheshire Cat grin, we knew we were doing good. It was good to have him on board again. BRUCE WATSON: Chris was definitely our key man at Phonogram in the early days. After he left, we were lost in an A&R wilderness so when we had a chance to work with him again, we jumped at the chance. Chris is very hands on with the songs and being in the studio with the producer and engineer making suggestions that made a huge difference to Big Country. Big Country’s guitar sound was famously designed to be reminiscent of bagpipes. Can you tell us how this came about? TB: I don’t believe the guitars sounds were designed to be anything but original and exciting. Due to the use of an open D string in a lot of the two-note guitar melodies, it insinuated the sound of bagpipes (which work in the same way). 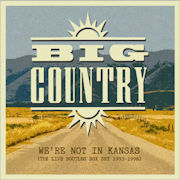 By the mid-1990s, Big Country had been playing consistently for over a decade. How do you feel the band’s approach to playing live changed and developed over that time? BW: The sequence of events is always demo, record and then go out live and perform it. So it was a roundabout of learning songs, playing them and touring. It definitely changed, though. The band became better musicians but when you get better, maybe you lose that naivety of when you were still learning your craft. You lose that early spark. TB: The band simply got better in all departments. We were not prolific rehearsers, so set lists developed (as did songs) during a tour. The one element that I know improved with time was the blending of Stuart’s and my vocals. There are a number of covers within the live sets here, including two Neil Young numbers ‘Hey Hey, My My’ and Rockin’ In The Free World’, ‘Don’t Fear The Reaper’ by Blue Öyster Cult, etc. Who chose these covers and what do you feel Big Country brought to those songs? TB: The inclusion of cover versions was a product of the fact that we all, at some stage in our respective careers, played in covers bands. To be able to play our favourite songs in our style was a little light relief when adding material for B sides, etc. BW: At the time, it was getting fashionable for bands to do unplugged sets and covers so we just used to sit there in the studio, get the guitars out and play cover versions, which we then incorporated into our live acoustic shows. It was just a fun thing, really - we just chose the songs we wanted to do ourselves. Tony, Stuart and myself were all big Neil Young fans whereas Mark was more of a Steely Dan guy and there was no way we were going to cover their songs! Who would you most like to hear cover a Big Country song, and who do you think could do their material the most justice? BW: We used to cover the Gin Blossoms’ ‘Find Out About You’ live, so I’d like to hear them covering ‘In A Big Country’. TB: I recently heard a Big Country covers band (Angle Park) play an eclectic mix of Big Country tunes, which is possibly the first time I have heard anyone play Big Country songs - and they did them well. I suppose U2 could do a track or two justice. Which artists have inspired you personally, in terms of their live performances? BW: One of the greatest bands I’ve played with live is The Rolling Stones. We did two tours with those guys and they were such a big influence on me. Just from the musicianship point of view, they were one of the quietest bands I’d ever heard, with tiny 20 watt combos, and yet onstage, out front, it was the biggest sound I’d ever heard. Their stage craft was amazing. Tell us a little about life on the road. For example, did you guys travel on a tour bus or separately? TB: I don’t remember much about touring in the ‘90s. By this time, as much as I loved touring, they were blending into each other. Most of our journeys were done on tour buses but we always travelled together. BW: Back in the 90s, we were still using tour buses. At that time, we were doing a lot of support slots so we’d do one show with, say, the Stones and then go off and do our own acoustic shows in between that. So there was a great variety - a big stadium and then some wee shows in small clubs in Germany. One and a half hours on stage makes it worthwhile. The travelling can become a bit much. But you just have to remember your fans have paid their hard earned cash to come and see you so you make an effort that everything’s done correctly. Did you have a faithful road crew? BW: We tried to keep our road crew guys the same. We always had an A-list of guys we wanted to work with. There was always a great camaraderie between band and crew. TB: We had a brilliant and dedicated road crew who we treated with a great respect. Big Ron Manigley, who was our dedicated stage manager (drums and bass tech as well), was someone I knew from my secondary school. There are, unfortunately, some brilliant crew members who are no longer with us, but they will never be forgotten. Were you sensible or was there a lot of rock’n’roll debauchery (feel free to reply “no comment!“)? TB: We weren’t that rock and roll, not compared to others, but we had a laugh. BW: None of that kind of stuff! (laughs). You read about all that in magazine articles but we were just into the music - we were kind of boring that way! Until the ‘90s, Big Country had enjoyed a long and productive relationship with Mercury Records. How did changing labels affect you as all as a band, do you think? BW: It did affect the band. At the time, as we said, our key man Chris Briggs has left anyway so every time we did a different album, it was a different set of people. It was completely different by the time we left. TB: We initially had a good relationship with Mercury but after Chris Briggs left, we were made to feel like outsiders, and that continued until No Place Like Home, where everything collapsed. Big Country have always had a sizeable following, predominantly in the UK, and of course, particularly in Scotland. Which other countries have you toured where you were surprised by the level of devotion you received? TB: We always had great audiences in the US, Germany, Holland, Belgium, Denmark and Finland (Europe in general). I have a vague recollection of the Peace concert in East Berlin in 1988. I remember that Michael Jackson was playing at the same time in West Berlin. It was a great night. BW: Just last year, we went out to Australia and New Zealand with the new line-up and got a great reception. Back in the 90s, we went out to Kosovo when the conflict was happening - the audiences were actually amazing. How has your fan base evolved over the later years? Do you feel you have acquired new followers, or have the crowds tended to be made up of the same devoted enthusiasts throughout this period? BW: Because you have this social media thing and YouTube, people find out about you that way. Also, you get younger people as well as the old die-hards. Can you remember any antics or memorable/infamous incidents from that mid-1990s period of touring? BW: As I say, we ended up being a support act playing gigs with artists like Meat loaf and Dylan, so it was always good to see what was happening on the big stages. TB: If I did, I wouldn’t tell you! Push comes to shove, what would be your favourite-ever Big Country performance? TB: All performances were great as far as I was concerned, but my proudest moment was being in the finale at Live Aid in ’85. and we could play all night – they won’t let us get off stage. The first time we played there - Hogmanay 1983, I think it was - was particularly special. Track 12 written by (Young/Sampedro). track 12 by Sharandall Music / Wixen Music Ltd.
tracks 7, 10, written by (Adamson/Watson/Butler/Brzezicki). track 5 by Sony/ATV Publishing, tracks 9 & 12 by SGO Music Management / Windswept Music. track 9 SGO Music Management / Windswept Music. All tracks Ⓟ2017 licensed courtesy of SGO Music Management Limited. With special thanks to Stuart Ongley (SGO Music Management), Bruce Watson, Tony Butler, Mark Brzezicki the family of Stuart Adamson. and all at Cherry Red Records. © 2017 Cherry Red Records Ltd. Marketed and distributed by Cherry Red Records.